Spinners who read my blog invariably ask me in person or by email, "You seem to have traveled extensively and go to Africa repeatedly. What exactly do you do?" True, I never talk about my day job, but that's because it has nothing to do with fiber. After all, it's a day job. Well, okay. A large part of my day job is handling the logistical arrangements for conferences and workshops in Africa. That goes from identifying the hotel, requesting bids, securing contracts, engaging interpretation services and equipment, arranging airport transfers, planning meals and banquets and, finally, settling the bills. On top of that, I look after the well-being of 150 traveled-exhausted participants who may sometimes lose their luggage or get sick. It's not uncommon, either, to find at the very last minute that the hotel has overbooked and, therefore, the management announces that a number of the participants will have to be taken to another hotel, at least for one night. That is never acceptable to the team I work with. Therefore, with all sangfroid, I go to the hotel management and tell them calmly, "it's in your best interest that you keep all of us right here". That seems to work everytime. Talk about the bottomline. At the end of the day, I would spin on my Little Gem for a cool down. When colleagues would insist on a drink at the bar, I would take my knitting along. One time someone quipped, "I've never seen a woman knit in a bar -- it's the last place you think you'd see someone knitting". Then on the last day, I'd make a quick trip to the market to see crafts and fabrics. Then, even more knitting -- at the airport this time. After three years, I started to get tired of the whole routine. Plus, I'm really scared of flying and my anxiety would show up two weeks before departure. Skin rashes would appear and my suitcase would be packed and ready at about the same time. Strange and conflicting behavior. However, the team I belonged to was almost like a second family and my colleagues were a pleasure to work with. But if I had to continue doing the job, I felt I needed to find a way to make the trips less predictable, more worthwhile, and even more interesting. And that is how I thought of starting a personal project of buying with my own funds spinning wheels made of PVC and bringing them to Ethiopia. It didn't have a name. It was a diversion and form of sharing spinning experiences with women who I would not -- but for my job -- have the chance of meeting. 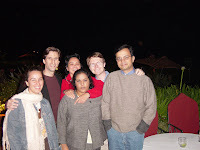 Caption: Our first workshop: Nairobi 2002. How could I leave such a warm bunch of people and the coolest manager (second row, left) ever?